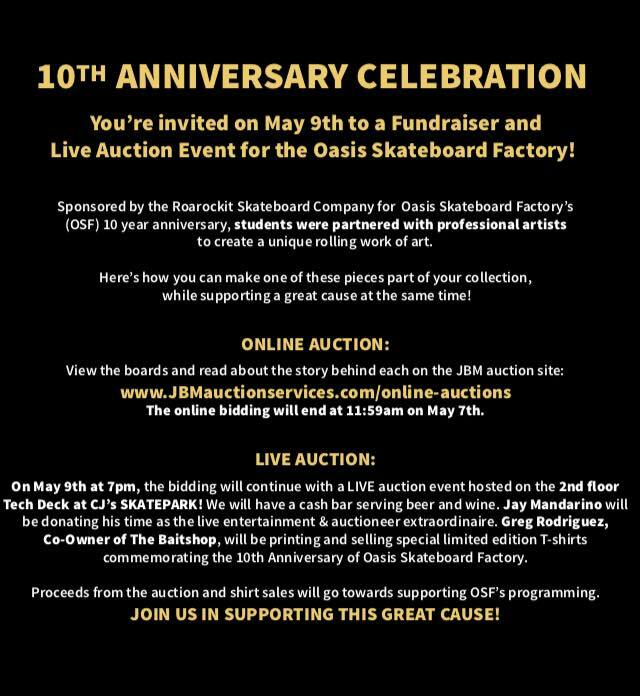 Loving skateboarding for most of my life, I am so stoked to be able to participate in the Oasis Skateboard Factory program. 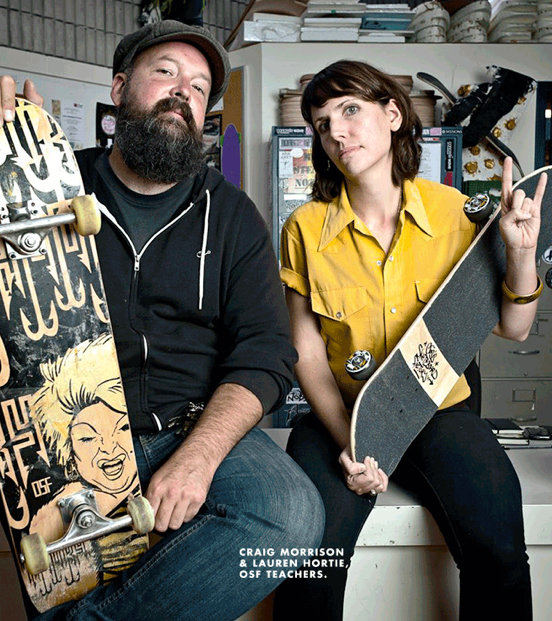 Having run my own business for the past decade, I'm so excited to be involved in assisting students on the business side of building companies and selling their skateboards and other awesome stuff. 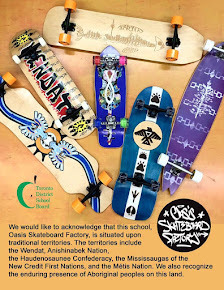 I have been with the Oasis Skateboard Factory since February as an intern from OISE. 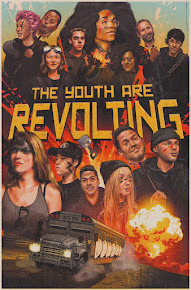 I am super psyched to get the chance to work on a zine with the students! I play in a lo-fi post-punk band and align myself with the DIY culture embodied at OSF. 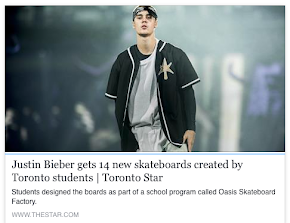 I am an intern from OISE and I am super excited to learn first hand about the alternative program offered at Oasis Skateboard Factory. As a former roller derby girl, i jumped at the opportunity to intern here! I love street art and building things, and I cannot wait to work on boards with students. I’m a student here at Oasis Skateboard Factory; I just finished making my first skateboard inspired by the old-school/Mexican “days of the dead” tattoo style. The graphic is of a skull with an old-school flower and banner held up by a bird. The board has a dark brown mahogany stain that brings out the natural lines in the wood. My reason for designing it with the tattoo style is that I’m very inspired by tattoo art and have tattoos myself. When I get older I will probably go into something tattoo related. Going into this I just wanted to create a graphic that was simple and tattoo inspired. I used no color to create this image, only black and white, which makes the graphic bolder. The bold lines and lack of shading also really bring out the contrast in the image. To create this board first I stained it, and then let it dry over night. Then I taped on the stencil I previously made the week before and sprayed it on. Then I removed the tape and had my finished project that I am very happy and proud of. So overall it was a pretty easy project. Overall I learned a lot of new skills and techniques to use on boards that I will continue to make in the future. I like the way the stain looks on the board and I’m happy that I learned how to do that along with other things to create more boards. Next time I would like to not rush it because the end result will turn out much greater if you just give it time. Update: The OSF students achieved a 90% pass rate on all course attempts for Midterm Report Cards. Students are motivated to complete the awesome boards they have started (custom work mentored by Ted Hunter of Roarockit in process pictured above) and the "O-tangs" are in...Loaded (California) has shipped the wheels that students will get to set-up their longboards once they complete the program! Stoked by a visit from Stoked (NYC)! 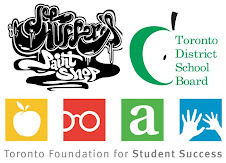 While doing research for a magazine article we are writing on the "Top 10 SK8 Charities", students were informed and inspired by a visit from Stoked Mentoring. 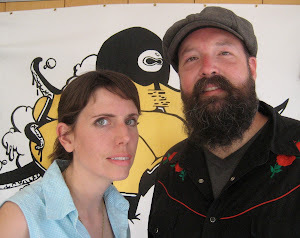 Steve and Sophia travelled from New York City to spend time building a custom board at Roarockit and to see how we engage and empower youth in the OSF. 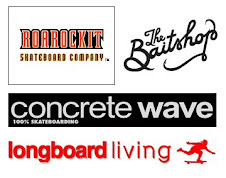 We are stoked to partner with Stoked on future projects! I love stencil design and attempting to skateboard! I love random images put together to create something completely odd. I like playing around with drawing characters with weird features when I work in my sketchbook. The drawing this board is based on is my version of my friend. In the first movie we ever watched together the main character had a TV for a head; I created this character, to represent him. This was the first of many great memories with my best friend and he is such an important person in my life. My first great amazing board had to be dedicated to him. ☺ I love you beauty! I love stencilling and I figured to make this board the best I could I had to STENCIL! It’s my favourite technique. I love how stencils are simple but always have this detailed look to them. I blended the background of the board from red to yellow because they are warm colours and stand out and catch your eye. I kept the same effect for the guy’s outline: silver to white. I learned more about spray paint techniques and how to blend colours and control drips. I stencilled everything else over with black to help the image stand out like a comic book style. I love how this board turned out! It’s my love child and I’m so proud of myself. I’ve been going to OSF for about a month now and this is my first custom board. I wanted to use my characters from my new brand “Kutz” to launch my brand to the public. I came up with the name “Kutz” for my brand because of the characters I’ve been drawing for awhile; I really like creepy cute things! The characters I plan to put on my line of boards are supposed to represent the young woman in street art trying to get their stuff out there, even if they might get a couple “kutz” on the way. 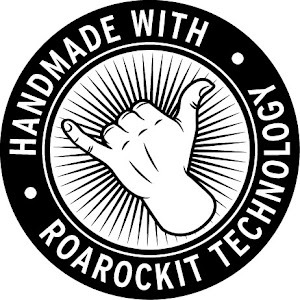 My first board was a pintail longboard pressed out of Canadian Maple using a Roarockit vacuum bag. I used tape stencils to create my graphic. I put my character on the side of my board and enlarged it so it would have a dynamic asymmetrical balance. I misted tints and shades of colours on to my board and combined them to make a more vibrant complementary colour scheme. 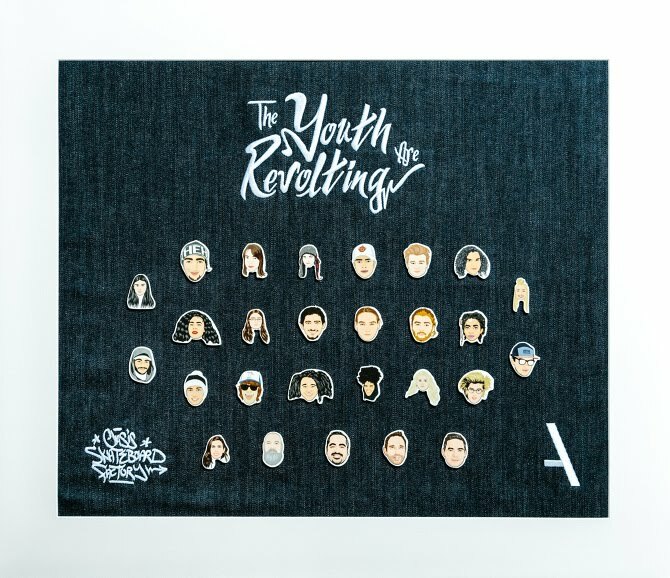 This made a really eye-catching board that I think will appeal to other youth like myself. I’m happy I transferred to OSF; I got to build and design my own skateboard for my first project. I’m really looking forward to getting sponsors, putting my work out to the public and actually getting paid for my artwork. 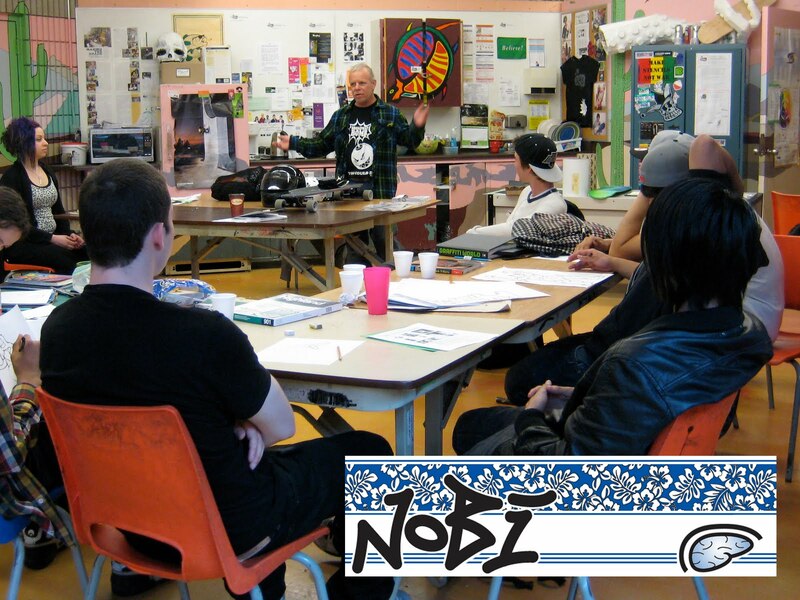 Communication: The student uses their newfound knowledge and inquiry into skateboard graphic design to visually communicate sustainability concepts and an environmental consciousness in a publicly presented skateboard (blog & gallery show) with an original image that leaves some exposed wood. 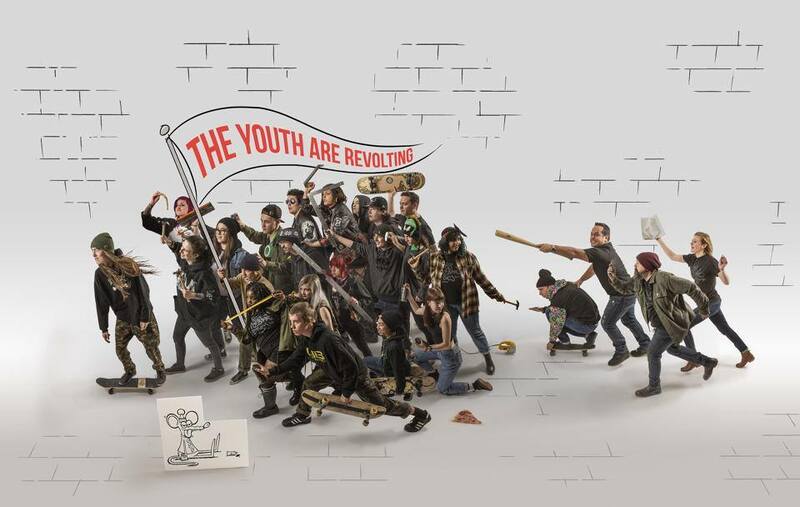 Application: The student has applied their newfound knowledge of skateboard graphic design to visually communicate sustainability concepts and an environmental consciousness as expressed in their artist statement in a skateboard submitted to the Bamboo SK8 contest by the deadline. I really enjoyed working on this beautiful bamboo skateboard. I just started this program, and this was my first board I’ve worked on. I love this program and enjoyed using your environmental theme as my first theme for a board. The image on my board is of a rainforest with endangered parrots on it. This theme communicates environmental consciousness because people should realize how beautiful the rainforest is, and how it has endangered species that should be protected. The rainforest is being torn down too often. I hope that this board helps people realize that the rainforest should be protected. I communicated my theme/concept through inspiration of my love of forests (not only rainforests but bamboo forests as well!) and this relates to the environment. 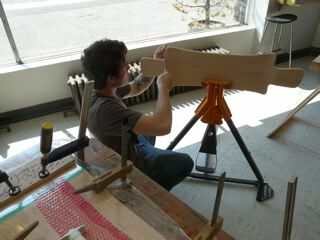 The elements and principles of designed I used include bold lines and vibrant colours, all evenly spaced on the board. The images on the board also have layers, the tree is in the background, and then there’s the smaller parrot and then the close up of the second parrot. I choose these images because I thought it would make an attractive, colourful board that people would notice. The parrots signify endangered species in the rainforest and the tree I thought would make a suitable background. The materials used were tape, stencils and spray paint. I used a paint marker to make small details for the feathers on the white parts of the parrots. From making this first board I’ve learned how to make smooth clean looking art through stencils and spray paint. Thank you for the opportunity to work with your bamboo skateboard, and thanks for the positive feedback I got from you guys. I’ve truly enjoyed what I’ve produced. I’ve been going to this program for a year. 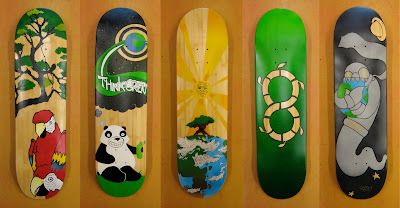 I really enjoyed working with these bamboo boards from Bamboo SK8 and the theme of sustainability. The bamboo has really nice grain that I wanted to show through the paint and be a part of the end product, so I made sure to keep it in while thinking of designs. What is “thinking green” if it’s not thinking about our planet and the environment around it? With the theme of bamboo in there, what else but a panda? I like the simple cartoony style of the panda and the rest of the design. I like to draw simple bold characters with humour. I used colour and flowing shapes to create a nice movement through the board. I stenciled many layers using tape and did details with paint marker. I found it problematic to figure out what layers to do first, but it turned out well in the end. I have made six boards from maple in this program, so it was nice to try working on bamboo for a change. It was challenging to make my graphic relate to the actual wood and theme of the board itself. It took a bit of work, but I like the end product and I hope Bamboo SK8 does too! Hey, I am 17 years old and live in Toronto. My board design communicates a perfect sustainable world and a happy sun growing a massive bonsai tree. The universe is the bamboo grain to show that there is a large amount of both. The sun is happy because it sees we are making a success by trying to keep our planet clean. The tree grows huge and healthy because we are using bamboo as a new resource so other trees can live their full life. My inspiration was the world, because it is my home and I like to keep my home clean. The materials I used to create this graphic were masking tape and an X-acto blade to cut the shapes out, spray paint to lay down the colours, and a paint marker to go around the edges of the image. I used warm colours to follow my image’s meaning with texture on the suns face to show lighting on the parts that stick out the furthest and emphasis with the sun shafts to follow your direction to the face. I am satisfied with the board and how it was similar to the way it was drawn on the template. My skills have definitely got better after the first time I did the Bamboo SK8 contest. I had fun with this project and hope to win! Hi. This is my second semester is OSF, and this is my first street deck (I’ve only made Longboards). 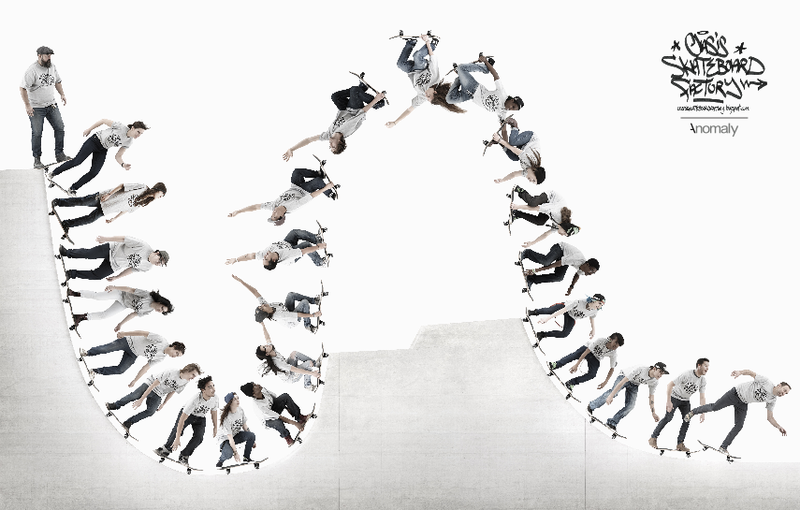 The theme for this skateboard is based on Cradle-to-Cradle design, (sometimes abbreviated to C2C). Put simply, it is a waste free way to the design of systems. The image I have put on this deck communicates C2C through the infinity sign. If you look at the deck, it is split up to look like a “C”, and a backwards “C” connected, representing infinite green resources. The infinity sign is made to look like Bamboo, again bringing up organic materials. My inspiration for this deck was the Bamboo SK8 deck. I wanted a clear crisp image, with colors that mixed well with the deck. The colors I used on the board are brown, a few shades of green and speckles of black. I didn’t want to put too many colors because it would take away the focus of the part of the deck I left blank. I found that this bamboo deck was easy to paint on, and it had a nice shine to it when done. 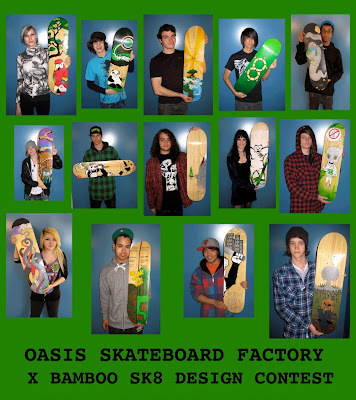 I would love to work with Bamboo SK8 again and appreciate the feedback from the Bamboo SK8 interns. I love the way it turned out, how the colors are very vibrant/stand out. I’m very happy with the end results. Thanks to Bamboo SK8 for the opportunity! It’s my second term at OSF. I’ve made a few different boards at OSF but this is one of my favorites for sure. The theme of this board is human greed and how it is consuming our planet, and how corporations and the people running them seem to have the planet earth and all its resources in a chokehold. The genie character is meant to represent the corporations and their greed; the Earth is supposed to be…Earth. I used a monochrome black, and grays for most of the board (greed), using colour only to highlight important parts of the board (earth). 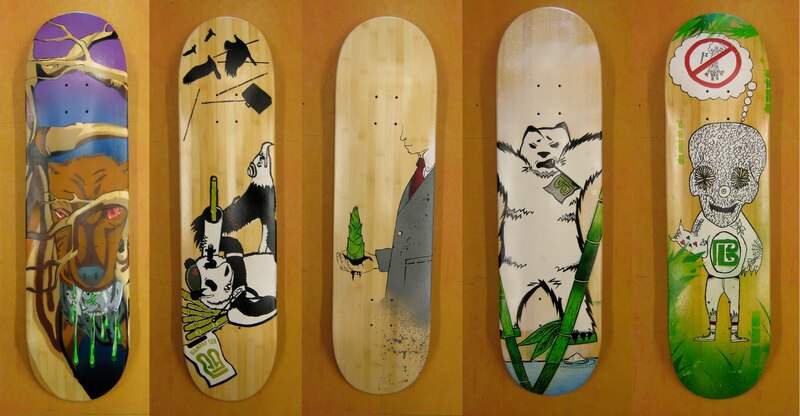 Bamboo was really fun to work on: this board is 70% bamboo, which gave me a nice smooth background to spray-paint on. All in all I had a very fun time with this project. One of the things I learned during this project is that sometimes things don’t need to be very bright and colourful to catch your eye, and I’m glad I learnt, because I will be doing a lot more in grey scale from now on. Another reason I’m so happy with this board is because I put my character related to my personal brand on the board, so not only do I get to make a board with my new character on it, I get to submit my original artwork to Bamboo SK8! 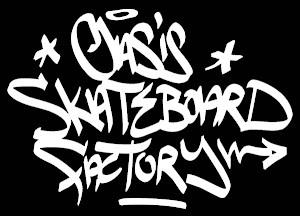 I am a student leader at Oasis Skateboard Factory. 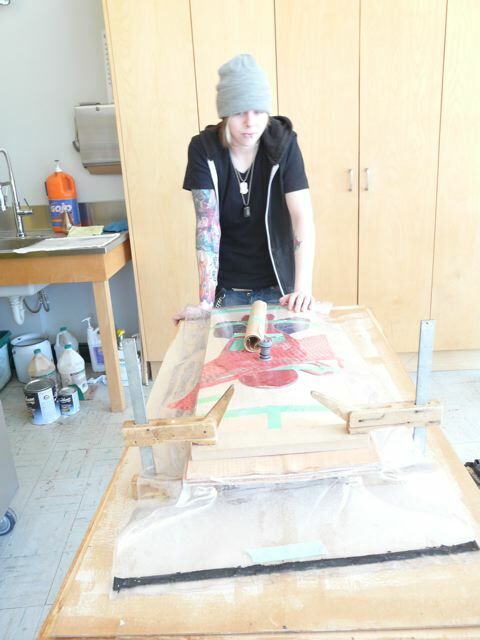 I’ve been here since last September, and since then I’ve done most of my graphics through stencil work. I quickly noticed the power of repeating an image to communicate a strong message. My image shows a wolf munching on a can of something toxic, whether it is a pop can, oilcan, or paint can. Our city is full of litter on the ground and so are our public parks; people all over are ruining our environment by littering, and ruining animal habitats. I want the message behind this image to be not to litter when you can recycle instead. Do it for the animals! People wouldn’t like it if a bunch of garbage was dumped on their living room floor. Sometimes our litter can be really harmful to them. A big part of sustaining our planet is helping the wildlife thrive. Considering we were supposed to use natural wood in design of the board, I decided to use three different browns in the tree so that the colours blended to give it a bit of a softer, earthy feel. I made the sky go from black to purple, and made the wolf’s drool a fluorescent green for a bit of contrast so it pops out more. I personally had a lot of fun making this board so I hope everyone else enjoys it just as much as I enjoyed making it. Through this process I learned to make use of colours better to enhance my images. I was really excited to get to do a project with Bamboo Sk8 the first time and just as excited the second time. I really support their cause and am glad to be a part of that. 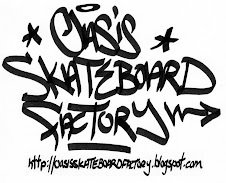 I'm a student at Oasis Skateboard Factory. I'm also a skateboarder and have been for 8 years. Skateboarding has given me many opportunities in my life and now being able to design board graphics for you guys has been added to the list. 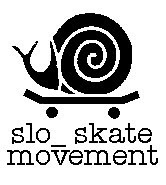 The theme of my skateboard graphic is, as I like to call it, "The Fight for Sustainability". The concept came from my sketches of pandas doing different actions; the one that was most impactful was the panda soldier. Once I had some input from you guys I was ready to make my graphic. Incorporating the bamboo as his arsenal was to portray how bamboo is sustainable and how your company keeps the fight going by finding alternatives to the harmful deforesting companies, the soldier’s ammo. I then had to figure out who the panda was fighting, I had some ideas of business men or loggers who are the cause of deforestation but I had already made a panda soldier so I thought of keeping the animal theme going and make them into some sort of animal. First animal that came to mind was an eagle, the glorious bird of prey that represents the American dream. So I drew an eagle and then put it into an apprehended position with his wings tied behind its back; this was to convey that the eagle was captured by the panda soldier, depicting that what you guys accomplish, you may not stop the whole logging industry at once but you do capture that one eagle. On the nose of the board the rest of the eagles are retreating, fleeing from a barrage of bamboo fire, dropping their briefcase as they flee. This is to further convey the theme of fighting the corporations, who cut down forests for profit and do not think of the environment or their impact. In a brief summary, the company Bamboo SK8 is the Panda Soldier and the eagles are the big name corporations and even though you guys are out numbered, you still put up a good fight and even have the other companies running for their money. 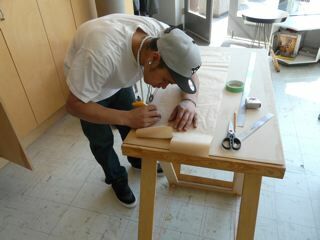 Like all the boards made at Oasis, we use a series of stenciling and graffiti techniques to paint our boards. My graphic was all stenciling, I made the graphic across the horizontal grain not only because the cannon the panda soldier held was pretty lengthy horizontally but because it went along with the bamboos natural grain. I'm happy with the final product, I was inspired a little by what Mystery is doing, their new marketing campaign is called Color Theory and since all their videos are in black and white they add a little bit of color here and there to make it more contrasted. I did this my own way, the panda and eagle are already black and white and then I added the silhouettes, so I added a little color to the graphic, making it more bold. The bamboo, helmet and the rope tying the wings were the only color I added, it adds more emphasis to certain areas of the graphic to convey the message more clearly. The thing I took from this project the most was to make less detailed graphics, the stenciling was brutal. All the little hairs that stick out, it was a little strenuous but in the end it was worth it. Thanks for the opportunity and I hope you enjoy what I have produced. I hope to hear from you soon. I’m an Oasis Skateboard Factory student and this is my artist statement for the Bamboo SK8 project. The theme of the project was sustainability and the need for the business sector to take more responsibility for their impact on the environment. My Idea for the design is a man in a suit holding a baby bamboo chute. It’s supposed to get across the point that the business sector holds the power to make or break our environment, and that we need to take more responsibility in the way we conduct manufacturing of commercial products. Once I had my image worked out I approached the painting of the skateboard like I would doing graffiti in the street. I did the fill first. I did two-tone fades on the suit jacket with Shark and Rhino grey spray paint that fades to bamboo at the bottom with splatters. The tie’s fade was done with Bloody Mary red and a maroon. From here I made the shirt collar white and threw together four greens for the bamboo chute. I left his hand and face bamboo and I left the man faceless because he represents large corporations. To finish, I taped it off and did the black detail with spray paint and touched it up with paint marker. I created texture with the multiple layers of green paint in the bamboo chute and in the fade of the tie. Over all I’m pretty happy with the outcome of the design. I tried a lot of techniques I haven’t used in the past and they all worked out the way I wanted for the most part. For instance, the way the suit goes from solid to splatter: it’s a little sketchier than I would have hoped, but for a first try I’m happy. I tried to do something similar with the white collar: it didn’t work out as well and is the only thing I’m not happy with about this board. What I took away from this experience is that not all images need to be fully outlined to work; some things work when you leave them open-ended. 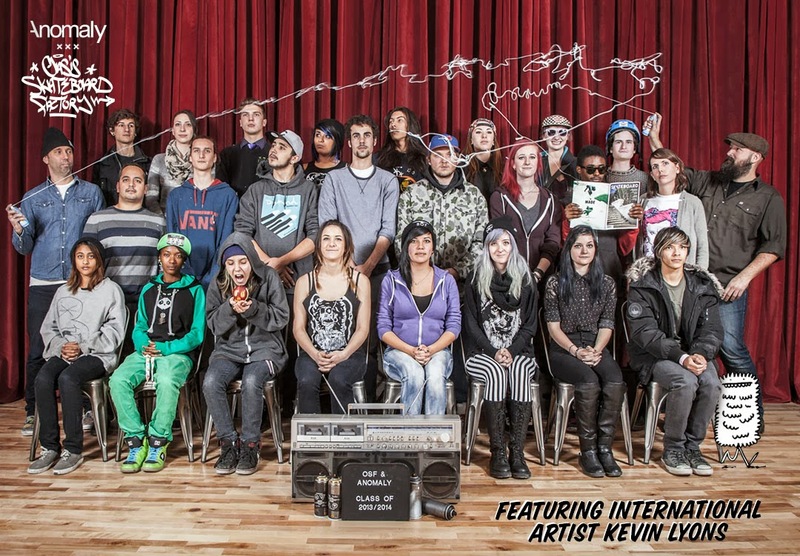 I’d like to thank everyone at Bamboo SK8 that made this project possible. 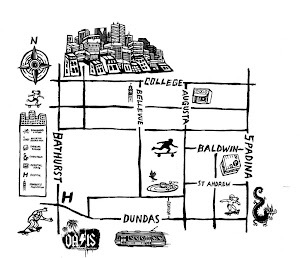 I live in Toronto and I love to make stencils and love skateboarding☺. My image communicates sustainability because my polar bear is on bamboo stilts lifting himself up from the water because of global warming melting all the ice. One major concern to our earth is the glaciers melting. If the water line rises then our coastal cities will be under water. The polar bear is standing on stilts made of bamboo because Bamboo SK8 is selling bamboo boards. Bamboo is a grass and grows like a weed constantly. Instead of cutting down maple and it taking years to grow back, bamboo constantly and we won’t run out of it. Bamboo is a sustainable material. I used are spray paint but I used different techniques like misting and drip’s on my board. I’m happy with the way I blended all the colours. I cropped my image off the board to make it look more urgent; we have to save the earth NOW! I like my board a lot because it’s the first board I’ve done. I feel special being involved in this. Not many students get to work with a California company. I’m excited to get my art out there. I learned many different things about sustainability and why it’s important by being part of this project. I just completed designing the bamboo skateboard and I’m really happy with the outcome. My graphic is a sugar skull on top of an environmental themed tattooed panda’s body. The panda has the legs of a skateboarder standing in a bamboo jungle thinking to him self that everyone should stop chopping down trees to make skateboards and start using bamboo. The materials I used to create this design were spray paint and paint markers. I used a combination of stencils and free hand drawings on the board to create a variety of fine lines. On my next boards I would like to continue to explore tattoo art and Mexican Days of the Dead imagery. I’m stoked with the outcome of my board and I hope Bamboo SK8 will be too! I really enjoyed creating this and I would just like to thank the Bamboo SK8 interns for giving me the opportunity to be a part of this. Hey there! I'm 16 and I just switched to Oasis from Western Tech. 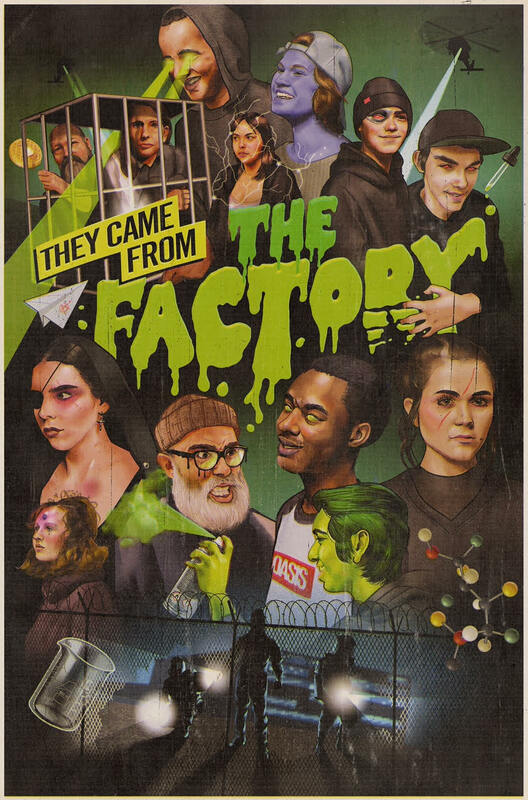 All my art has a story behind it. Here's the story of this drawing is as follows. Once not so long ago there was a girl named Tsuchi (meaning earth or soil in Japanese); she is one of Mother Nature's many children. Unfortunately, she was poisoned by man's toxins and a demon took over her body and soul. Now she is only the shell casing of a horrible demon named Shi (meaning death or an ending in Japanese). Shi works to destroy the earth. Tsuchi worked so hard to keep healthy. Shi can control the elements and he makes them turn on themselves. Tsuchi's soul still resides in her body fighting Shi to destroy his dream of destroying the planet we call home. Tsuchi can't do this alone, she needs help from us the people who live on this planet we call home. If we don't help Tsuchi her soul will eventually die. It's a race against time to save her and the place we call home. Each element is symbolized by a part of the board. The clouds are a symbol of air and wind. Tsuchi's hair symbolizes fire, the tentacles symbolize water and finally the bamboo of the board symbolizes earth. What inspired me to do this graphic is a picture I found on the Internet of a geisha's hair reaching up into the sky with a hand at the end and a mouth at the base near her neck. For most of the graphic I just taped off what I needed and spray painted using different techniques to emphasize the vibrant colours I used. For the smaller details like the clouds and the girl I used a combination of paint markers and sharpies to create a variety of lines and highlights. I personally really like my design. There are a few things I wish I had more time to work with, but overall I really liked the design. Participating with Bamboo SK8 was a great experience and gave me a lot of insight on how it is to work with a client that isn't in my community. I learned so much, such as spray-painting techniques and ways that you can manipulate paint to work the way you want it to. I thought that this board portrayed exactly what I wanted it to. Hi, I am a student here at OSF. I’ve been here for one semester and I already find the program amazing. 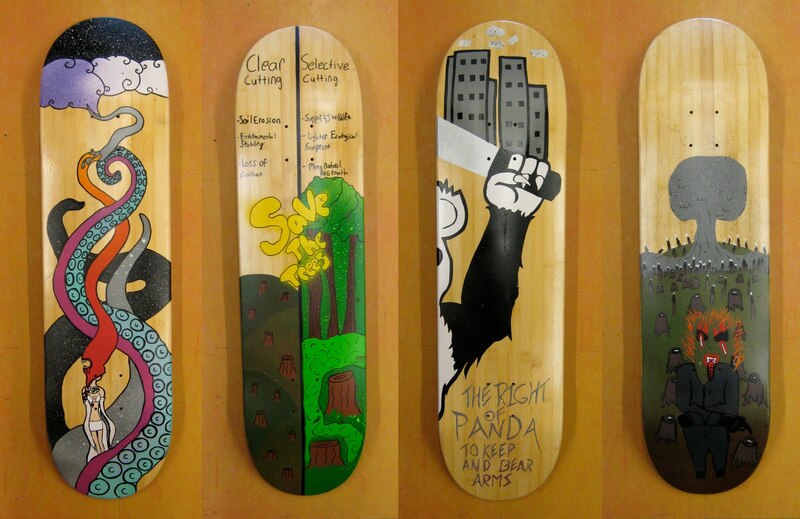 This semester one of our main projects was to design a sustainability skateboard for Bamboo SK8. The sustainability theme I chose was selective cutting compared to clear cutting. On my board I have shown a contrast of the two by showing them right beside each other and showing some of the environmental facts of clear cutting and selective cutting. Since selective cutting is a better way to preserve the environment, it is clearly portrayed on my board. The images I used on my board were mostly trees and grassy areas, but there was a difference on each side of the board. On one side the trees were cut down completely and the land was barren showing that clear cutting does not help to preserve the environment. On the other side the land is preserved and only select trees have been cut down, showing that selective cutting is a great way to cut down trees and preserve the environment. My inspiration for this project was my old geography teacher who used to tell us that selective cutting was the way to the future. The materials and techniques I used were paint markers, spray paint, different hand-cut stencils, and taping techniques. Some elements and principles of design I used were repetition in the tree stumps and colour fading in the trees. 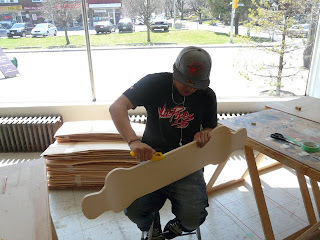 My personal feeling about this project and my skateboard is that it was a fun project for an interesting company. Bamboo SK8 is a cool company because they are innovating the skateboarding world and they let us be a part of it. 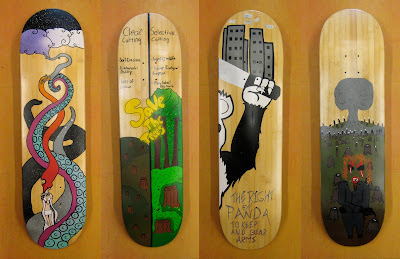 I liked making the skateboard because it was cool to see everyone’s take on the world’s different environmental issues. Hey. 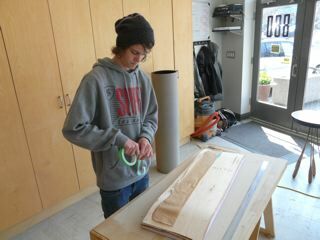 This is my second semester at the Oasis Skateboard Factory. The bamboo board I have produced is my fourth board over all. The theme of my board is animals fighting back! We have destroyed animal’s habitats by deforestation and pollution. Even though Bamboo SK8 doesn’t use panda unsafe bamboo, Pandas are associated with bamboo and I wanted to show a giant panda holding a machete heading towards the city. Cities have encroached on many animal habitats; this panda is representing “the right of panda to keep and bear arms” so back the “f” off! I learned a lot about different panda species as I investigated sustainability issues and I’m totally behind the animals now. I created this image of a panda holding a machete up like a rebel and used contrast with back and white to make this bold image. I created clean lines by masking off the board and cutting stencils; stencils are a good technique for the cartoonish style of my art. I really enjoyed how this board turned out in the end. I had a hard time coming up with a clear idea in the beginning, but after the Bamboo SK8 interns emailed me back I got on the right track. 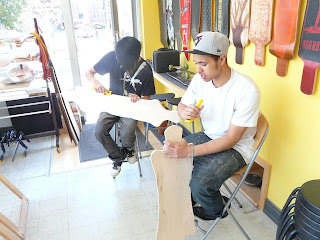 I was able to learn a lot, so thanks to the Bamboo SK8 interns for this project. I really hope I win the contest and thank you to Bamboo SK8 for this opportunity. Hello. This is my second semester here at the Oasis Skateboard Factory and I'm loving it. Since the start of the year I've jumped at every chance to work with artists on boards and even producing more boards than required to pass. For the graphic on the bamboo board I was given by Bamboo Sk8, I am showing a side of unsustainable resources by having "The Devil’s Lawyer" signing a document to destroy the forest. In the foreground the Devil’s Lawyer is signing the paper and in the background there is a forest partially destroyed. The image of “The Devil’s Lawyer” signifies that deforestation is a bad way to treat the earth and shouldn’t be done. A large portion of what inspired me to make this board was my interest in keeping the earth alive and full of plants and the animals that come with them (like us). I used spray paint for the larger images, but for the detail on this board I decided to use paint marker instead. The tree trunks and trees in the distance create rhythm and the wood grain on the top of the board compared to the bottom shows a bold contrast. I really enjoyed working on this board because it made me think about how we really are affecting the earth. I learned about more sustainable resources because it was not just me making an eco - friendly board, it was my whole class and we all helped each other with our eco – friendly ideas. I'm a skateboarder and artist. This is my first independent board; this board was for my new brand. I wanted to do something simple because my first board for Bamboo SK8, was very detailed and took a very strenuous process to complete. This board is just black with my logo 4EV3R, which is just an outline in white. The white and black theme is one of my favourites because it’s simple, bold and high contrast at the same time, so that’s where I went with my first graphic. I made the logo large and across the almost middle of the board, like simple skateboard designs commonly used in the industry. Most board companies like Blind, Element, Mystery, etc. 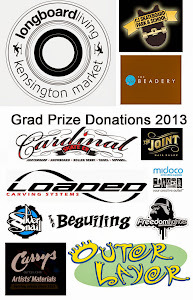 have a solid background color and their logo, which is an easy, simple and effective design for a board graphic. I just wanted the logo to stand out, the name of my brand being the main focus and nothing to distract from the name. My next board will actually have an image, but for this one I just wanted it to be simple. I’m happy with how it turned out and I am eager to move on to my next project. Today students spent the day in Parkdale exploring how to insert their brand logos into the media landscape through a series of subvertising exercises at The Baitshop. Students ended the day checking out the 3D graf by KWEST at the Mascot. Wow! 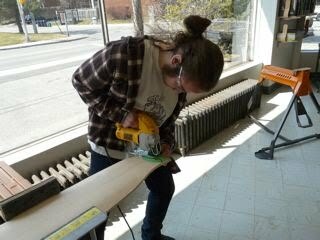 The OSF Custom Crew are being mentored to build their Dream Decks by master-woodworker Ted Hunter. 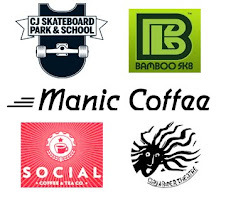 March Morning Attendance Award: Thanks to Matt at Manic Coffee for donating this month's prizes from one of the coffee brands he carries in his shop.